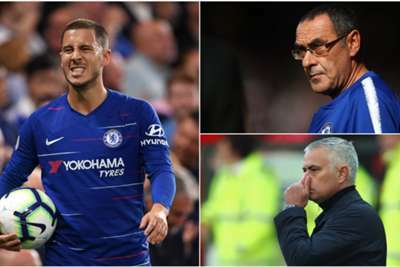 Eden Hazard has consistently been one of the Premier League's best players since he joined from Lille in 2012, but he has seemingly found another level following Maurizio Sarri's appointment. Hazard's start to the 2018-19 season has been truly exceptional, with the Belgium international scoring seven times in eight Premier League games ahead of the visit of Manchester United and former coach Jose Mourinho this weekend. Sarri's appointment as coach was always highlighted as a potential boost to Chelsea's attackers following more the more pragmatic approaches of Antonio Conte and Mourinho. It was under the latter that Hazard enjoyed two of his best seasons at Chelsea, but Sarri seems to have transformed him into a player capable of challenging for the Ballon d'Or. As Chelsea prepare to host Mourinho's United, we look at the Opta data which shows Hazard is performing even better than he did in his days working under the 'Special One'. The most obvious element of change in Hazard's play under Sarri has been his increased shooting frequency. During his time under Mourinho's watch, he averaged 2.1 shots per 90 minutes, but this season that figure is significantly higher at 3.6. Hazard's increased threat around goal has not impacted negatively on his creative responsibilities as he has again proved more effective than he ever did with Mourinho, averaging 0.5 assists every game - 0.3 more than his spell with the Portuguese coach. He is also enjoying increased effectiveness in possession, attempting 72.5 passes per match. The most he ever averaged in a season with Mourinho was 59.2, highlighting the fact he is far more involved in Chelsea's general build-up play. It is a common misconception of Mourinho's teams that he expects players to do a lot of running, particularly the full-backs and wingers. But as it turns out, Hazard is running further on average with Sarri, having covered 10.4 kilometres per match this term, as opposed to the 10.3km he ran every 90 minutes for Conte's predecessor.